PeriSight Zoom is a compact and ruggedized optronic module, designed to meet the needs of the military regarding long range night & day vision. It includes state-of-the-art technologies, such as an uncooled thermal camera and a visible color low light camera (downto night 3). It allows to detect long-range threats, and may be used as a sight mounted on military vehicles or for recognition and identification of targets. 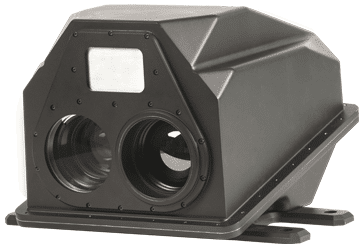 Discrete thanks to its uncooled thermal channel, the PeriSight Zoom increases night & day observation capabilities due to its zoom and its optical channels. It can be mounted on a Pan & Tilt turret to stabilize and select the image field, for a 360° situational awareness. The optional laser-range finder module gives a precise distance information on the observed target. PeriSight Zoom can be used alone, or in network with other modules from the existing PeriSight range, for example to ensure sensitive sites surveillance. A cutting-edge color low-light imaging sensor provides a first image even in extreme low light conditions (~3 mlx) without additional illumination. A high-resolution uncooled thermal sensor provides recognition and identification in any night conditions. Bertin Instruments provides expertise in positioning the PeriSight Zoom according to the user’s needs and his vehicle type. As an option, the PeriSight Zoom can be connected to a proprietary calculator (VigiSight 65) ensuring electronic stabilization, automatic detection and tracking. Bertin Instruments provides full integration services for the PeriSight system. Videos are displayed on a screen, which is also used to command and control the PeriSight.